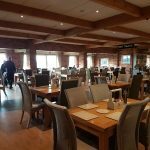 Tucked away in Gates Garden centre is a restaurant with a large range of cakes, meals and drinks. Complete with a log fire. Perfect for a cosy cup of tea.